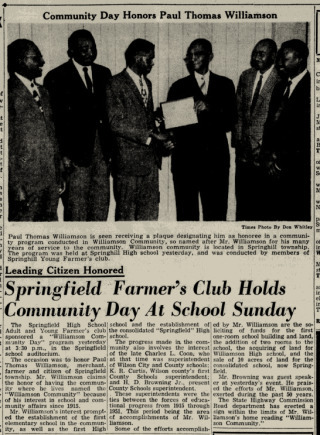 Merchant-farmer Paul T. Williamson donated the land upon which the Wilson County School Board built a six-room high school to serve African-American students in southwestern Wilson County. Williamson High School, which opened in 1942, later became known as Springfield High School. Wilson Daily Times, 18 January 1960. Wilson Daily Times, 28 December 1960. In the 1880 census of Springhill township, Wilson County: farmer Elic Williamson, 44; wife Gracy, 29; and children John, 14, Lugen, 11, Joseph, 9, Jennie, 7, Mary, 6, Clem, 4, Sarah J., 2, and Pall, 1. In the 1900 census of Springhill township, Wilson County: farmer Alex Williamson, 63; wife Gracy, 50; children Genny Whitley, 26, and Sarah, 22, Paul, 21, Daniel, 19, Henietta, 15, Edna, 15, and Katie Williamson, 12; and grandchildren Nancy, 8, Della, 5, and Pearle Whitley, 4. On 23 November 1904, Paul Williamson, 25, son of Alex and Grace Williamson of Springhill township, married Mary Hinnant, 23, daughter of Joe and Rhoda Hinnant of Spring Hill township. W.H. Horton of the Christian denomination performed the ceremony at Thom Hinnant‘s house in the presence of J.T. Hinnant, L.H. Horton and W.H. Shaw. In the 1910 census of Springhill township, Wilson County: on Wilson & Smithfield Branch Road, farmer Paul Williamson, 31; wife Mary, 28; and children Beatrice, 4, and James C., 3. In the 1920 census of Springhill township, Wilson County: on Old Clayton & Wilson Road, farmer Paul T. Williamson, 40; wife Mary, 38; and children Beatrice, 14, and James, 12. In the 1930 census of Springhill township, Wilson County: farmer Paul T. Williamson, 51; wife Mary, 48; daughter Beatrice, 24; son James C., 23; daughter-in-law Anna D., 22; grandson James W., 6 months; and boarder Ozie Allen, 35, a farm laborer. In the 1940 census of Springhill township, Wilson County: farmer Paul Williamson, 61; wife Mary, 57; daughter Beatrice, 34; son James, 33, filling station operator; daughter-in-law Anna, 32; and grandchildren Jantice, 8, and Paul W., 6. 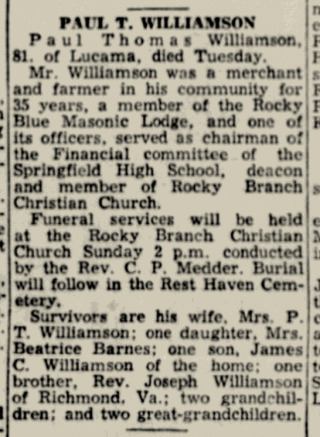 Paul Thomas Williamson died 27 December 1960 in Lucama, Wilson County. 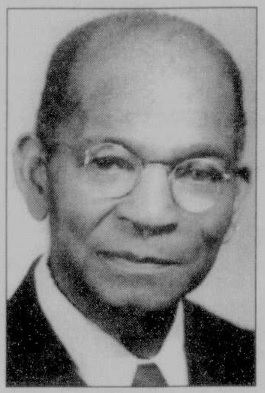 Per his death certificate, he was born 14 February 1879 in Wilson County to Alex Williamson and Grace Shaw; worked as a grocery store merchant; and was married to Mary Williamson. Photo of Williamson courtesy of Wilson Daily Times.